UC San Diego broke ground Monday at a 10-acre site that will be the new home for Sixth College on the site of two parking lots on North Torrey Pines Road. 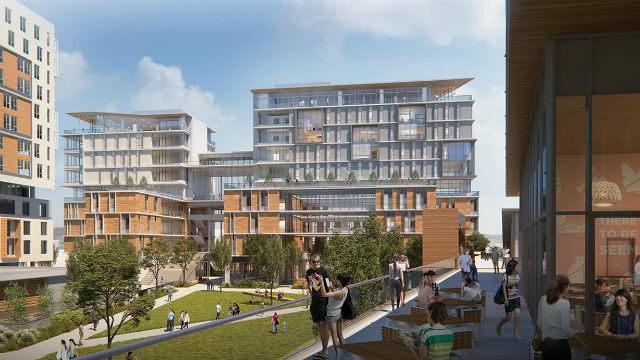 The project, expected to be completed in 2020, will include two new academic buildings, a market, dining hall, retail center and dormitories for 2,000 undergraduates. The new buildings will total 1.6 million square feet of space. Located between Muir and Marshall Colleges on the west campus, the site encompasses current parking lots 207 and 208, whose spaces will be replaced by a new underground parking structure. The new academic buildings are for the Social Sciences and Arts and Humanities departments. The buildings will include eight general-assignment classrooms, four active-learning classrooms, and four lecture halls of varying sizes, the largest accommodating 600 students.